Baseball’s Murderer’s Row used to be the first six hitters of the powerful 1927 New York Yankees. Today, the game’s most feared opponent may well be the nasty little green and yellow pixels your neighborhood weatherman points to on the evening news. What transpired tonight in Detroit was absurd. With a line of showers closer to Indiana than Detroit at the 8:00 p.m. ET starting game time, Major League Baseball inexplicably delayed the start of the fourth game of the ALCS. Finally, at 9:25, with light rain still 30 minutes away, MLB postponed the game. This is an outrage on so many levels and rivals the idiocy of the 2002 all-star game that ended in a tie. Had the rain been minutes away from Comerica Park – truly close to meteorological inevitability – the delay would have been a bit more understandable. But it was far enough away that: 1) a good chunk of the game could have been completed, and 2) the precipitation could have dried up or circled around Detroit. Unlike the situation in St. Louis, the precipitation heading to Detroit was merely steady rain, hardly the stormy weather that produced a Severe Thunderstorm Watch for the St. Louis area. It’s quite possible the game’s final innings could have been played before conditions worsened to the point where a legitimate delay may have been warranted. There was also a remote possibility that the entire game could have completed before the first drops of rain came down. Just as it’s been since Abner Doubleday invented the game, October baseball is fraught with weather issues. It’s likely to be chilly, windy and rainy. It happens. And it’s been happening for a hundred years. 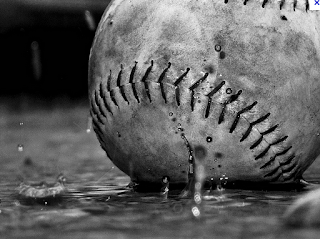 To its credit, MLB recently changed the rules regarding rain delays in the playoffs to ensure that no game would ever end without going its full length. The fact that this rule exists makes the decision to delay and then cancel a game nearly two hours before the onset of rain even more unconscionable. To be sure, there are two interests that baseball is protecting. One it will admit and one it won’t. It’s possible, maybe even likely, that starting pitchers may not have been able to resume the game after a long delay. (We’ll let the babying of baseball pitchers be another topic for another day.) But, so what. That’s part of the game. Perhaps a weather-savvy manager might even be bold enough to hold out a starting pitcher in expectation of inevitable rain. The second reason is – this just in – MLB wants to keep New York on the baseball radar for as long as possible. Had the team’s ace, CC Sabathia, been forced to come out of the game after a delay, it would have hurt the Yankees already slim chances of winning the series. The postponement effectively keeps general interest in the Yankees team for one more day. We can only conclude that Bud Selig was doing his best Jim Cantore impression, sitting in front of a large monitor trying to make sense of those annoying little pixels. Clearly, he confused the green radar echoes with greenbacks. P.S. A whopping .04" of rain fell during what would have been the third full hour of the game. I think it's totally ludicrous not to start the game when the weather is perfect--it's called a "rain" delay, not a "we think it might rain later so we won't start the game" delay. They should have started and dealt with the weather if it arrived. I was pretty bummed too. Really wanted to see the Yanks lose last night; guess I'll have to settle for today. I too had my suspicions that the postponement had something to do with protecting the Yankees on some level. Never heard of a game called preemptively like this. I wonder if it's ever happened -- we'll have to ask Nate Silver or Baseball Reference. Why you got to hate on my Yankees.........don't hate the players hate the game,MLB called the game,not the Yanks.The Yankees pitching is not the problem,its the hitting,its like the entire lineup forgot how to hit.Does anyone know the wind speeds in Detroit today,could use any help they can get to push their fly balls over the fence.Also the postponment doesn't give the Yankees an advantage,because now they lost a travel day and if they want to bring CC back and somehow the Yanks force a Game 7 he will have to go on 3 days rest,where as Verlander will have full rest......I now this is a weather blog and I have digressed.........Yanks are toast anyway so I'll shut up! Big Daddy, I don't hate the players. I just think the vast majority of people are bothered that MLB clearly favors the Yankees. As for the baseball effect of the postponement, if I'm a Yankee fan I'm still glad that my best pitcher won't have to leave after 5-6 innings and be done for the night. Before they can worry about him coming back on three day's rest, they need to win Game #4 or it's all moot. @Bill,no doubt,would love to see another complete CC gem.......got your point. Sandy could be a memorable storm. Also, the game getting cancelled this year HURT the Yankees as it forced the Yanks to use CC Sabathia (their best pitcher)in game 4. With no off day after game 4, CC would not be available to pitch in game 7. It ended up not mattering as CC stunk that night and DET completed the sweep. From a fans perspective, it would be beneficial to have the game cancelled BEFORE traveling to pay for parking, etc. For the fans that attended game 4 in DET and drove, they had to pay for parking twice. Once for the rain out date and once for the next day when the game was played. collections of instrument to measure wind speed for weather station a wind speed evaluating tool requires for predicting weather reporting accurately. From wind speed and its direction a precise weather prediction is possible.